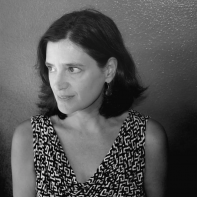 Carolyn Guinzio is the author of four collections, most recently SPINE (Parlor Press, 2016) and SPOKE & DARK (Red Hen, 2012) selected by Alice Quinn as winner of the To The Lighthouse/A Room Of Her Own Prize. Her work has appeared in The New Yorker, Agni, Harvard Review, Boston Review, Bomb, and many other journals. Her photographs have appeared in Conjunctions, Beloit Poetry Journal, New American Writing, Fiction International and elsewhere. She lives in Fayetteville, AR and is the text editor of the online project YEW: A Journal of Innovative Writing & Images By Women (yewjournal.com).